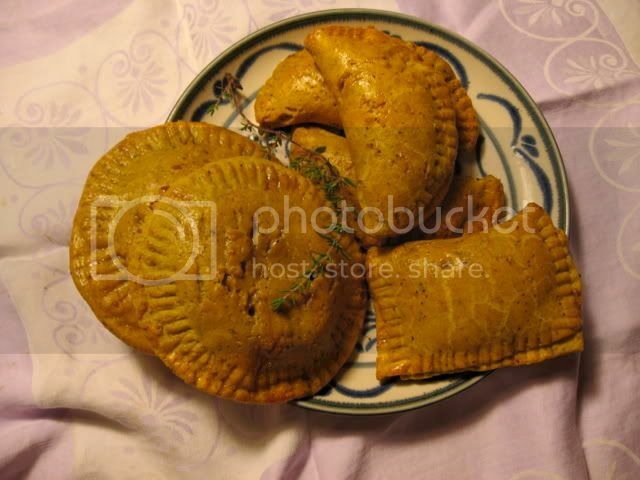 At the Ashby Flea Market in Berkeley, CA, there's a truck that sells Jamaican beef patties - Each patty a flaky, orange-hued pastry wrapped around moist, flavorful meat. 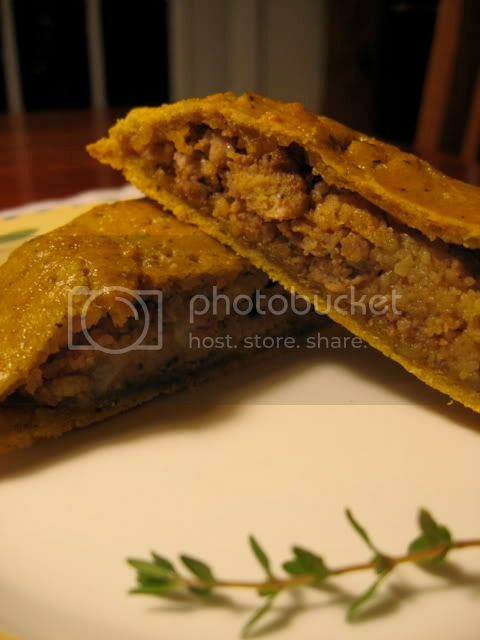 A patty is a savory and convenient meal-in-a-pocket, a Jamaican knish, if you will. Though I haven't eaten them for years, walking by the truck at the flea market when I was living in the Bay Area always reminded me of the first time I tasted a beef patty as a kid. The flavors still stand out in my mind, so I knew that I wanted to try my hand at creating a kosher and gluten-free version of this Caribbean delicacy. I love how they turned out. They are definitely less greasy than the original, and with a dough that is chewy and full of flavor, rather than flaky and greasy. They were a big hit in my household. For dry gluten-free bread crumbs, you can make your own by baking left-over bread slices on low-heat until they become completely dry and crumbly (I collect the ends of all my loaves in a ziploc bag in the freezer for this purpose) and then pulsing them in a food processor. Or make it easier on yourself and just purchase some pre-made gluten-free bread crumbs. This recipe will leave you with a lot of the flavorful meat mixture left over - You may want to save it, as I did (try mixing it with rice, or turning it into a flavorful Shepherd's pie, or mixing it with your favorite soup) or you might choose to make a double-batch of the dough for twice the patties. Double the patties, double the fun! They will last a few days in the refrigerator, and heat up very well in the toaster oven or a regular oven. I do not recommend microwaving them. Public service announcement: Don't forget to wear surgical gloves when you handle habanero or scotch bonnet peppers - Washing with soap is often not enough to remove the infernally hot oils from your skin. Be sure not to touch your eyes (or anywhere else sensitive), and immediately wash your cutting board thoroughly to avoid a spicy surprise at a later date. Not a fan of spicy foods? Use a little bit of dried cayenne or a minced jalapeno instead. 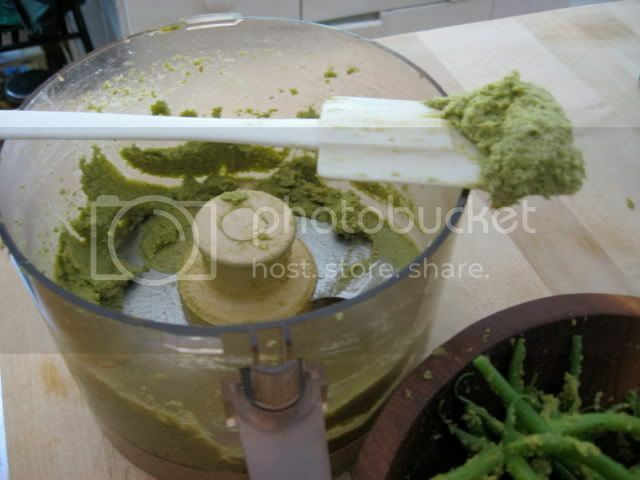 In a food processor or standing mixer, combine all dry ingredients, pulse until fully blended. Add 3 tbsp coconut oil, egg and coconut milk. Blend until well-combined. Dough should be easily formed into a ball. Wrap ball in saran wrap and refrigerate while you prepare the filling. Add 2 tbsp coconut oil or margarine to a heavy skillet over medium heat. When the oil is heated, add onions and sautee until translucent. Add garlic, thyme, carrot and minced peppers. Sautee until carrots are slightly tender but garlic has not yet started browning. Add ground turkey and all spices. Using spatula to break meat up into small pieces, allow turkey to brown slightly but not cook through fully. Add breadcrumbs and broth. Stir well, turn heat to low, cover skillet, and simmer for 3-5 minutes while the breadcrumbs soften and absorb moisture and the turkey finishes cooking. If there is still a lot of liquid in the skillet, add a small additional amount of bread crumbs to absorb it. Taste and adjust spices accordingly. Remove from heat. Unwrap refrigerated ball of dough. Use a rolling pin to roll it out to about 1/8 inch. Fold it over itself and roll again. Repeat this process several times, folding the dough up into layers and then rolling. Finally, roll dough out until it is 1/8 inch in thickness. Cut dough to desired size - A 6" diameter bowl will work if you want to make empanada-shaped half-crescents (or double them up on top of each other to make circular patties). A dough cutter works for cutting out rectangles that can be folded over to make smaller rectangular patties. Using a pastry scraper, move dough shapes carefully to a greased baking sheet. Remove 2 tablespoons of meat from skillet at a time, compressing with your fingers to create a dense "patty". Place meat slightly off-center in the dough shapes, making sure none of the filling reaches the edges of the dough. Fold edge of dough over and use a fork to seal the edges thoroughly. Make sure there are no holes in the dough - If there are, use a moistened finger or small bits of dough to repair them. Brush each patty lightly with beaten egg you've set aside. Bake at 375 for 20 minutes or until each patty is golden-brown. Serve while hot. Patties can be refrigerated for several days, and warmed in a toaster oven or conventional oven at 200 F.
Writing this recipe round-up has made Randy Travis' song "Too Gone for Too Long" play on a loop in my head. I hope I haven't been too gone for too long to make a comeback with another episode of the Semi-Weekly (Ha!) 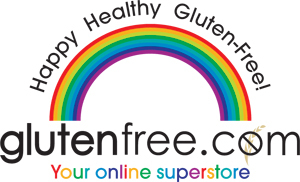 Gluten-Free Recipe Roundup. Forgive me for dropping the ball - And many thanks to Seamaiden for picking up the slack. I'd like to draw everyone's attention to her beautiful and innovative Buckwheat Crepes with Lowfat Creamy Mushroom Filling - They are a great example of innovation in presentation, and they are nutritious, to boot. The weather has cooled down enough for me to get excited about cooking and baking again, and I have some time on my hands before school craziness begins, so I thought I'd give you a taste of the most intriguing gluten-free recipes on the blogosphere. By the way, if you're wondering what that picture is... 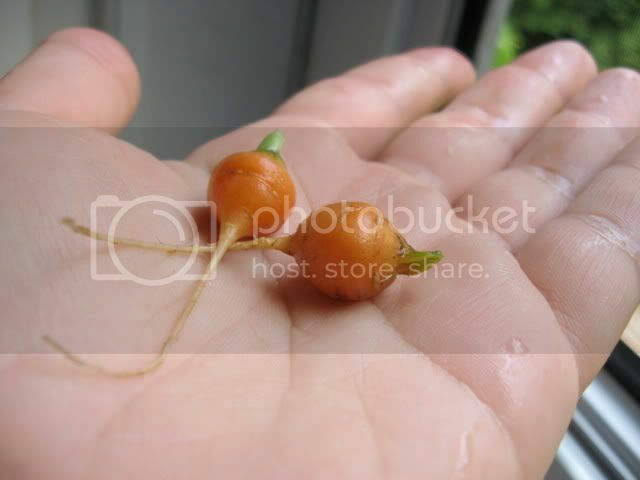 It's itty bitty baby Romeo carrots. I was thinning my carrots and these are the "thinnings" - Candy-sized carrots that are sweet as can be. The big ones are might tasty, too. 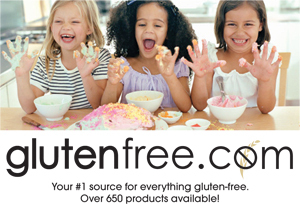 Disclaimer: As usual, there are recipes on here that call for ingredients that can be found in both gluten-free and gluten-laden versions (soy sauce, breadcrumbs, etc). There are also ingredients that can be found in kosher and non-kosher versions (and of course milchig and fleishig and pareve). I haven't checked over every ingredient list with a fine-toothed comb, so be sure to check labels, and be creative! Seamaiden of Book of Yum recently tagged me to do a meme called 8 Random Facts. And by "recently" I mean "almost a month ago", but we all know what a slacker of a blogger I have been this summer! I don't usually do memes but this one looks fun so here goes. 1) I have had a lot of jobs, and they are every bit as varied as my personality and my interests. Among other things I have worked as a prep cook, a soda jerk, a UPS airplane loader, calendar editor for a magazine, a warehouse manager, an adult toy salesperson (ahem), an administrative assistant, a leather-cutter and a railroad conductor. 2) The past few months I've been having a love affair with the area where I grew up and recently returned after my 10 year self-imposed exile. 3) I drive a purple car. I like to call the color "eggplant", and it does look black at first glance, but really it is purple. And kind of sparkly. It is the first car I have ever owned. 4) At any given time I have about 5 different business plans stewing in my brain. 5) I want to have a big Jewish family with a whole slew of kids. 6) I cannot understand why people live with animals. 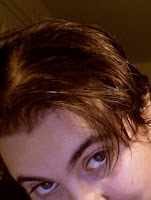 I am allergic to cats and many dogs, and the idea of sharing my living space with a non-human mammal makes me shudder. However, I love farm animals and wildlife. 7) I really love pickles, a whole lot. But only sour pickles - The more sour the better. Sour dills, sour garlics, they are all good to me. Pickled veggies, too. But sweet pickles offend me on every level. When I was in high school, before I had to worry about things like heartburn, when I went out with friends at night it was usually to the diner (the only 24-hour place in town), where I would order a whole plate of pickles and an orange soda. Yes, I have always eaten like a pregnant woman. I also find eating sour and salty foods like pickles and olives helps me with sugar cravings. 8) I have just become an honest-to-goodness college student for the first time in eight years. I am doing the prerequisites to (G-d willing) transfer into a program to become a Registered Dietitian or a Nutrition Educator. And if I were to be allowed a ninth thing, it would be that I think/hope many of you are going to be pretty excited about the next recipe I'll be posting! Dear readers, please forgive my seasonal inappropriateness. I tend to eat, and blog, both seasonally and locally as much as possible. My recipes reflect that. This pesto is something I made back in early July. I wrote the recipe down and photographed it, but never did anything with it. Today I was daydreaming about this pesto's delightfully complex balance between the sharpness and sweetness of garlic scapes and the nutty comfort of toasted pumpkin seeds (pepitas), and I realized that though garlic scapes are now out of season (June is the prime month for them in most places), I should blog about this recipe before I lose the envelope it's scrawled on. So I hope you'll pardon me for blogging about a delicacy you can't obtain. See this as a reminder that as summer starts to wind down it is a perfect time to start thinking about what we look forward to cooking next spring and summer, or use it as an impetus for some of you gardeners to consider adding garlic to your garden plans for next year! Since most of us don't follow recipes without tweaking them a bit, it occurred to me that this recipe could be a great jumping-off point for some experimentation. 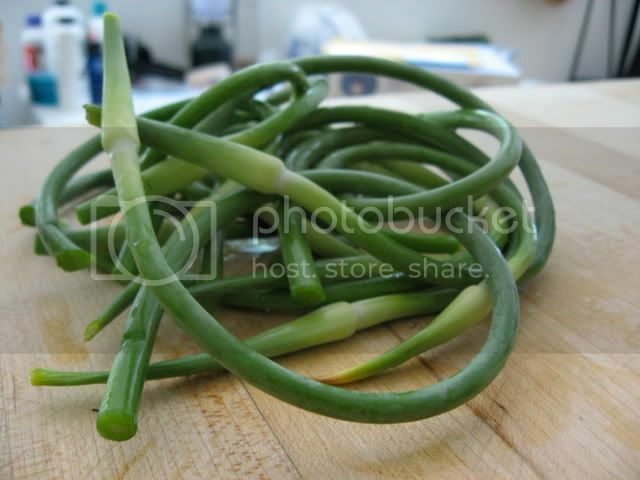 Maybe this recipe would be fabulous with lightly sauteed scallions and/or roasted garlic instead of scapes. 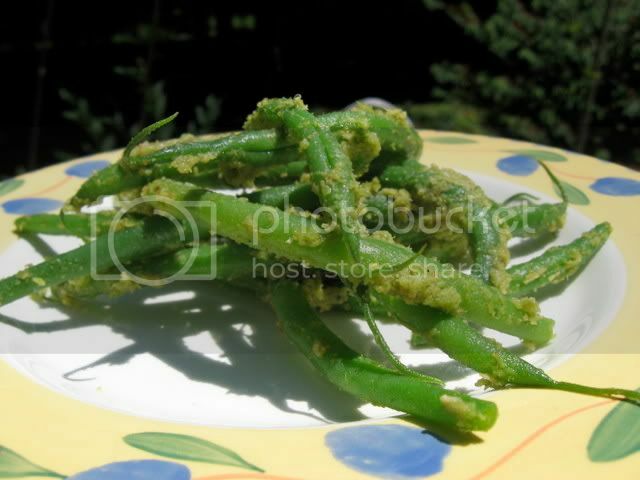 Or with lightly steamed green beans pureed into the pesto with raw garlic. I can imagine that roasted leeks would also be a wonderful replacement for scapes. As far as I'm concerned, finding replacements for seasonal ingredients is always an enjoyable challenge. The "scape" in question is hardly a typo or a secret code word; it's shorthand for garlic scape, a part of the garlic plant that is a garlic lover's nirvana. Here's the anatomy lesson: Garlic and its relatives in the allium family, (leeks, chives, onions) grows underground, where the bulb begins its journey, soft and onion-like. As the bulb gets harder (and more like the garlic we know), a shoot pokes its way through the ground. Chlorophyll-green like a scallion (maybe even greener), the shoot is long and thin and pliable enough to curl into gorgeous tendrils. The pesto I created is vegan, and truly has no need for the usual parmesan cheese. It is sharp with garlicky flavor from the scapes, which mellows over time. The nutty flavor of the toasted pumpkin seeds is just wonderful. This pesto can last for quite a while in the refrigerator. Try it tossed with steam vegetables, or mixed with steamed rice or quinoa. Spread it on fish before or after grilling or broiling. Mix it with hot Tinkyada brown rice pasta. Thin it with some additional olive oil and/or water to create a more saucy pesto that can be poured over salad, meat, fish, vegetables or grain dishes. Use it as a sandwich spread, or eat it alone on a crusty piece of bread. This is a versatile alternative to classic basil pesto or my fresh and clean tasting summery Cilantro-Lemon Pesto. I hope that next spring/summer when you see garlic scapes at your local farmers' market you'll remember this recipe and look it up... Or create an even more exciting use for these beautiful green spirals curlicues, and share it with us! Place pumpkin seeds in a dry, preheated skillet over medium flame. Stirring frequently, allow pumpkin seeds to toast until they brown slightly. They will puff up and start popping. Remove immediately from heat and pour into a bowl. Allow them to come to room temperature. Cut scapes into 2 inch pieces. Add all ingredients to food processor and blend until smooth. Add warm water or additional olive oil to thin, if desired. *Note: If you use pumpkin seeds that you removed from a pumpkin yourself (as opposed to pre-packaged, dry pumpkin seeds), you may want to try this method for preparing them. This recipe is part of the Weekend Herb Blogging event, hosted this coming week by Real Epicurean.